This setup will let you monitor Play Station 3 temperatures and throttle the cooling fan accordingly. [Killerbug666] based the project around an Arduino board, and the majority of the details about his setup are shared as comments in the sketch that he embedded in his post. 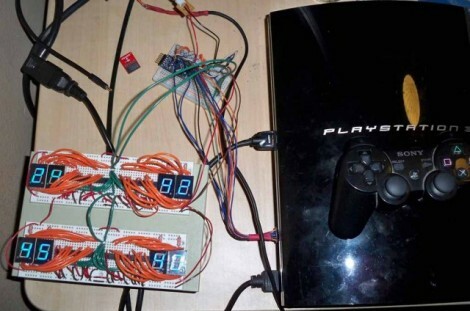 He installed four thermistors in his PS3 on the CPU heatsink, the GPU heatsink, the Northbridge or Emotion Engine, and one in front of the air intake grate to measure ambient room temperature. Above you can see the setup he used to display temperatures for each sensor on a set of 7-segment displays. The project also includes the ability to push this data over a serial connection for use with a computer or a standalone system. The project is still in a prototyping stage. It works, but he likens the fan throttling to the sound of a car engine constantly revving. Future plans include smoothing out the fan speed corrections and scaling down the size of the hardware used in the system. We’d suggest doing away with three of the displays and adding a button that lets you select which set of sensor data you’d like to display. code has some way to go. pretty messy in there. What the hell, why not use a thermisistor? @Life2Death, he is using a thermistor, but only to sense temperature, not to directly control fan speed. PWM is a better way to control speed, I’m assuming that’s how he does it since I didn’t really want to look thru all that code for the bit that actually did something. @PoopieHead, PID control is overkill, you don’t really need to hold the temperature at an exact level. And it’s not as easy as people think. print "too many if statements :p"
Ps3’s run SO hot. If there is any device that is actually worthy and quite possibly in need of a liquid cooling unit. This is it. Statement is wrong. Take some time to look on Google for PID tutorials and you will see it is very easy. My suggestion would be to do away with the 7-segment displays all together. All you need is four bi-colour LEDs that show green if the component temp. is within a defined margin from the ambient sensor and red when the component goes outside of that margin. You will also need to add some hysteresis into this design as I’m sure you will find out. Make sure Sony doesn’t come and get you. The PS3 has internal temperature monitoring and fan speed control. before arduinos people would carve their own pwm controllers out of driftwood and then walk 10 miles uphill through the snow to mine some lead for the solder. -no ntc however, one would have to add that. and unless you place the thermistor directly into the air stream of the fan without connecting it to a heat sink the whole thing will not oscillate.